Thanks to our friend Jeffery Passage, one of the things we have been investigating is pace of play by tee selection. When the USGA comes to our course, or any course for that matter, they rate each individual hole based on several parameters, and can tell us how long they believe it should take to play the course from each tee. Apparently all we had to do is ask for the information. So thank you to our local USGA, and I’m sorry we didn’t ask earlier. But one of the interesting things to notice is, logically, the time to play the golf course is shorter for the far forward tees, at 3 hours 21 minutes, and the longest at the far back tees at 4 hours and 40 minutes. The time it takes to play each hole varies also, from the back tees, they rate the short (time wise) hole as #17 saying it should only take 9 minutes to play with hole 13 being the longest at 21 minutes to play. This will help us a lot in explaining to players why it is so important to play from the proper tees, because it is our goal to keep every round to 4 1/2 hours or shorter in the the coming year. Much of getting a quality photograph is in the planning. 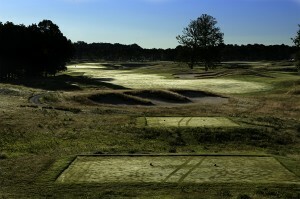 Contact the golf course and get permission to be there before the crack of dawn. Talk to the Superintendent, this is when the team is out on the course working which can be a conflict for both photographer and maintenance crew. Scout the course. What hole(s) do you want to capture. The golden hour, daybreak is very short, you won’t have time to be messing around trying to find your camera angle. To start with I recommend you pick 1 hole, find the perfect spot, and focus on getting 1 amazing image. Select your camera settings so you don’t have to be fooling around with them in the dark. I pick the lowest native ISO my camera offers, aperture priority, F11 (although I shot this at f/22 to get the star effect from the sun), and bracket a minimum of 3 stops. Pack a tiny flash light, or if your phone has one that can work too. Wear layers, it often starts out cold and gets warmer as the sun rises. Attach your cable release to your camera. Since it’s day break, you’re going to be shooting in low light part of the time. It may seem obvious, but don’t swing the cable release, or yank on it or jiggle it. You want the camera to be very still. Be at the course with your gear 45 minutes to 1 hour before sunrise. If there is trash, such as a plastic bottle in your shot, go pick it up so you don’t have to fix it in post. Use a cable release to prevent camera shake. Tuck your pants into your boots, I’ve ended up with creepy bugs inside my pants, only made that mistake once! Take pictures of the putting green. That’s what everybody wants to see. Try to capture shadows, they show the 3 dimensional aspect of the course. Get the whole putting green, if you don’t it creates a feeling that something is missing. Shoot from the time you can see the green with the naked eye, until 45 minutes after sunrise, then stop. Anything after that isn’t going to be your best shot. Remember you are looking for amazing, not cute. If you’d like to see a more thorough version of this article you can find it Updated Article on Golf Course Photography. Would you like to know about my post production a.k.a. Photoshop techniques. When asked “How would you rate most golfers’ pace of play?” they got a similar but reversed response. More than half of the respondents believed they were fast, and everyone else was slow. Okay, so on the deepest level, that’s probably the answer I agree with the most. But at the same time, I’m pretty sure that would have sounded like PR dribble to Brian. So then came the discussion, what really is a signature hole? 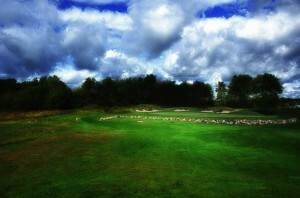 Is it the hole that is most representative of your overall experience at the course? If that’s the answer, then I proposed 16. But my peers would have argued with me. 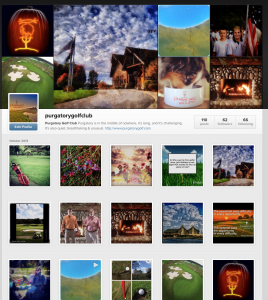 You see everyone at Purgatory Golf Club has their own favorite hole, and none of them are the same. That’s actually a good thing. So we came back to the idea that the signature hole, for us at least, is the hole with the most visual impact, the one you walk up to and gasp because of it’s beauty, uniqueness, and memorability. 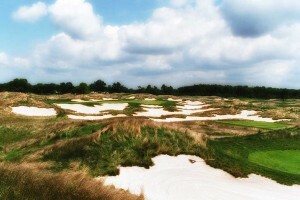 It that is the definition, the answer is without a doubt 17, Hell’s-Half Acre, the par 3 surrounded by an ocean of sand. Thank you to our buddy Brian Cable for such a fun intellectual departure from the ordinary, and into a lively high-spirited debated about our signature hole(s). By the way you can find Brian at https://twitter.com/bcable and http://thatcableguy.com. Because it is no longer being used as a last resort. They also said “In no way do The R&A and the USGA want to stifle creativity in making strokes by golfers.” That sounds contradictory. I don’t see how quitting the game better than using an anchored stroke? They pointed out that sales of long putters have increased. The logical conclusion is sales will go down after the ban. I don’t see how that is good. There is no evidence that anchoring affects performance or lowers scores, and they were very clear to say that performance was not a factor in their decision. Maintaining the “spirit” of the game is the reason they used to justify this ban. In that spirit, we should still be playing with gutta percha balls, hickory staffs, and using sand instead of tees. The PGA has over 27,000 members. They conducted a poll of their members on the subject prior to the announcement. Approximately 16%, or 4,228 people responded. That is a very high response rate. 63% of the people who responded oppose the ban because it will negatively impact both the enjoyment and growth of the game. You can read Ted Bishop’s letter to the President of the R&A and the Executive Director of the USGA here http://pdf.pgalinks.com/regmemos/TB_Letter_Davis.pdf. Bishop’s letter reflected well upon the golf community, he was respectful and a gentleman in great contrast to the behavior and comments made by the USGA & the R&A. What the USGA & the R&A may not be saying is they do in fact think it gives someone an advantage, even though they can’t prove it. But if anchoring really gave you an advantage, even 1 single stroke in an 18 hole round, every single player on the tour would be using it. If Tiger Woods or Rory McIlory were using an anchored stroke, I doubt they would be banning it. Mike is quick to point out to that Tiger is supportive of the ban. So Tiger will be happy, but what about the rest of us that don’t want the ban? This may be the defining moment for Tim Finchem, the PGA Tour Commissioner. Will he roll over and just do what the USGA says, or will he stand up and say “No, I won’t let you take this away from my players!” The PGA Tour is the 800-pound gorilla. If they walk away from the USGA the rest of the world will follow.